Oslo’s city government has issued an ambitious “climate budget” with the intent of halving its carbon emissions from 1990 levels by 2020, and becoming completely carbon neutral by 2030. To achieve this goal, the city plans to limit access for cars with new tolls and fewer parking spaces, power the bus fleet with renewable energy, increase cycle use and eliminate heating with fossil fuels in homes and offices. The move comes at a time when cities are taking on a more important role in addressing the issue of climate change. Globally, cities are thought to be responsible for roughly 75% of human-sourced carbon dioxide (CO₂) emissions, because urban populations still depend largely on fossil fuels to generate energy. Since CO₂ is the chief greenhouse gas, cities are considered to be key drivers of global climate change. Yet cities are also uniquely well-placed to address this issue; most cities have their own planning systems, which can be used to manage the local economy and the urban landscape (that is, land-cover and land-use), in order to regulate energy use. Until relatively recently, policies to measure and reduce greenhouse gas emissions were administered at a national level, to ensure compliance with international agreements, such as the Paris Agreement. But over the last decade, cities have started to play a bigger role in global efforts to tackle climate change. This is evident in initiatives such as the Global Compact of Mayors, of which Oslo is a member. The compact – founded by UN Secretary General Ban Ki-moon and former New York City Mayor Michael Bloomberg in 2014 – is a coalition of cities and local governments that are voluntarily taking action to combat climate change and move toward a more resilient, low-carbon society. To come up with effective policies for reducing emissions, cities first need a way to inventory their energy use. To that end, the compact has created a protocol that classifies energy use into six main sectors: stationary (for example, building construction and use); transportation; waste; industrial processes and product use; agriculture, forestry, and other land use and any other emissions occurring outside the boundary as a result of city activities. These categories account for the greenhouse gas emissions associated with burning coal, gas, oil and so on. But they also take stock of the gases that are taken out of the atmosphere by plantations and forests, for example. Completing a greenhouse gas inventory using the protocol can guide urban policies to reflect the character of a city. For example, cities in cold climates use more gas and electricity to heat buildings in winter, while low-density cities generally dedicate more energy to transportation, and cities with a strong industrial base expend energy on manufacturing. Becoming carbon neutral means reducing or even eliminating fossil fuel use, reducing landfill waste and offsetting any remaining emissions. Typically, the strategies involve incorporating aspects of technology (such as renewable energy generation), design (for instance, making cities more compact) and behaviour (for example, shifting commuters from private to public modes of transport). In the case of Oslo, its population of about 650,000 people emits roughly 1.34m tonnes of CO₂ per year, with much of this energy expended to meet building and transportation needs. While the plan to reduce emissions to zero is very ambitious, it’s worth keeping in mind that Norway already generates the majority of its electricity using hydropower. This gives Oslo options that other cities may not have. For example, adding to the electric car fleet is a common policy in many cities concerned about air quality and greenhouse emissions. But if the electricity is produced by fossil fuels, then electric cars simply shift the creation of greenhouse gases from moving transport to stationary charging points. 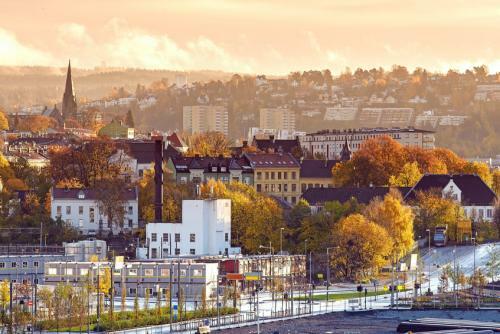 Likewise, most of Oslo’s homes are heated with electricity generated from hydropower, and by burning wood pellets, which are also considered to be a renewable fuel. Here, the challenge is to make homes more efficient, and to ensure that more fuel for direct and indirect heating comes from renewable sources. There is much to be learned from Oslo’s progress; in particular, it highlights the need for tailored policies and plans, to address the unique emission profile of each city. Yet the city will still need to overcome significant barriers, to become carbon neutral by 2030. In particular, it will need to offset any residual emissions through forestation, or by actively capturing carbon at the source. Yet Oslo’s carbon budget raises the stakes for other cities which are working to combat climate change. The greenhouse gas protocol provides a consistent, transparent and internationally recognised approach for cities to measure and report emissions, allowing for credible comparison – and a little healthy competition – between urban areas across the globe. Why the silence on climate in the US presidential debates?